If You love archaeology, this tour is a must for You. You can visit the most famous ruins of the Bay fo Naples. About Pompeii many books have been written. 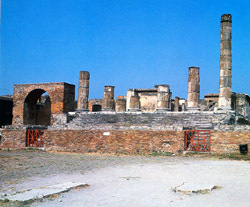 Pompeii was a large city for the time, and even more cosmopolitan than Rome, which was several days’ journey from Pompeii. 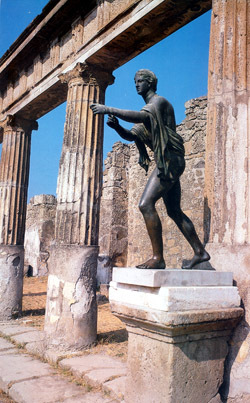 Because of Pompeii’s long and varied history of ownership, foreign influences - such as the practice of Egyptian religious rites and the use of Greek architecture - are evident everywhere in the city. It held administrative control over the neighboring suburbs, and was a centre for trade in crops, wine, and olive oil. When Vesuvius erupted, much of Pompeii was still recovering from the great earthquake of A.D. 62, and evidence of massive reconstruction efforts were found during excavations. Herculaneum is less popular than Pompeii, but very interesting too. Just nine miles north of Pompeii lay the seaside resort of Herculaneum, home to nearly 5,000 residents. Some of Rome's wealthiest citizens had homes here, where they could relax in the public baths that looked out on the sparkling ocean. Indeed, one of the most luxurious homes yet known in the Roman world was uncovered in Herculaneum - The Villa of the Papyri. Discovered by chance in 1750, the Villa rose high above the cliffs of the sea, with an ideal panoramic vista to the Bay of Naples and an expansive swimming pool. Among its many treasures, the Villa's library produced as many as 1758 papyrus scrolls, including texts of the Epicurean philosopher Philodemus of Gadara and some Latin texts. Oplontis is a pearl of the archaeology in the Bay of Naples. 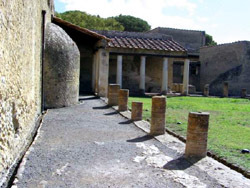 Among Pompeii and Herculaneum is Oplontis, about three miles from Pompeii, at the site of the present day town of Torre Annunziata. Systematic excavations at Oplontis between 1964 and 1984 unearthed several important villas, most notably “Villa B”, a house that is now known to be the Villa of Lucius Crassius Tertius. Inside the Villa, excavators found piles of jars called amphorae, which were known to hold goods such as wine, oil, and other agricultural products. Because of the presence of the amphorae, the building was thought to be a sort of business center where these goods were manufactured, processed, and sold. These finds, together with some public baths that were excavated there in 1834, help identify Oplontis as a middle-sized town. 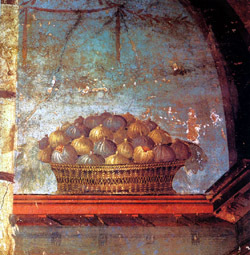 Though it was peripheral to Pompeii and under its administrative control, Oplontis had sufficient infrastructure to suggest that it was a well-developed residential centre.